It was a wild election night, and one gun owners are sure to never forget. Several elected officials, who have either blocked pro-gun legislation or said disturbing things about the 2nd Amendment have been removed from office. Additionally, pro-gun champion Christy Zito has retained her seat and will serve another term at the capitol. The fight isn’t over yet, and we’ll need your help to prepare for the general election — more on that in a moment. Chairman Tom Loertscher has been serving in the Idaho House for over 30 years. He was the most senior Representative in Idaho. For years now, he has been blocking solid pro-gun legislation proposed by the Idaho Second Amendment Alliance. Last year he shoved H.B. 444, real Stand-Your-Ground, into a desk drawer and let it collect dust. Chairman Loertscher also blocked an effort to expand Constitutional Carry. As a result, gun owners spent a significant amount of time and resources educating the voters in Chairman Loertscher’s district on exactly what he had done. Ultimately one citizen, Chad Christensen, decided to challenge Chairman Loertscher for his seat. Mr. Christensen knew that incumbents were difficult to beat. Chairmen with decades of experience are even harder. But Mr. Christensen had grown tired of Chairman Loertscher’s blocking of pro-gun legislation, and that’s why he challenged him for a chance to better represent District 32. Late into the evening, after hours of waiting for the final results to come in, we received news that Chairman Loertscher had been defeated! 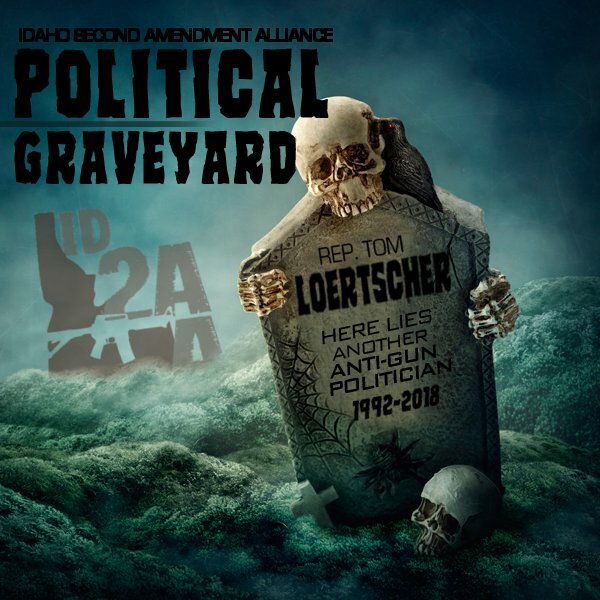 Gun owners in District 32 had finally tossed Chairman Loertscher from office! And he wasn’t the only one to be removed! Chairman Julie VanOrden, who recently made some disturbing comments about her views on the 2nd Amendment, was also dealt a crushing defeat by Julianne Young. Chairman VanOrden made a major mistake in underestimating her weak views on the 2nd Amendment, and how gun owners in her district would react to them. She paid the price at the ballot box. The last major victory came when Rep. Christy Zito, a pro-gun champion, defeated Oscar Evans in District 23. The establishment spent tens of thousands of dollars to defeat her. They handpicked a fighter pilot from the Mt. Home area in hopes that his military service would oust Rep. Zito from office. However, Oscar Evans made several major errors in his bid to take out a solid 2nd Amendment Representative like Christy Zito. First, he refused to fill out our pro-gun survey. Second, he mocked gun groups who raise money to fight for and protect the 2nd Amendment. Those errors, coupled with gun owners educating the voters in District 23 about his stances, handed Rep. Zito a major victory by defeating by 28% points! The general election will be here before you know it. There is no time to rest and we need your help to mobilize even more gun owners prepare for the battles quickly approaching! >>> First, please make sure to share this email with your family, friends, and acquaintances so they know that gun owners can make a difference! >>> Second, we need to recoup our resources, and help mobilize even more gun owners before the general election. If you can afford to chip in $100, $50, or even $25 today, we would sincerely appreciate it. >>> Finally, make sure to follow us on Facebook and Minds.com so that you are getting immediate updates from the front lines of the battle for the 2nd Amendment in Idaho. The 2018 primary elections have proven the power that gun owners have at the ballot box. You handed gun grabbers several major defeats. Now we need you to step up once again, and help protect Idaho from the onslaught of Michael Bloomberg and his cronies from Moms Demand Action. Even George Soros’s own son donated $5,000 to help elect Paulette Jordan as the Democrat nominee for Governor! This is not hyperbole. This is not fearmongering. The radical left is mobilized and coming to Idaho to change our state into the next Oregon and Washington. They are mobilizing for the elections in November and you are the only one that can stop them. While we don’t have the billions that they have, we have proven that we can do a lot with very little. So please, consider digging deep and donating whatever you can to help us expose them in November.